This week, the Global Freshwater Seed Accelerator Spotlight talks with Noah Technologies, Inc. the start-up company behind Intelli-Sensor. President David Rice and Vice-President Dan Fish recall how the idea sprouted from a simple conversation at a Florida flea market. Welcome, David (Rice), Dan (Fish), and Carol (Strackbein). Please, tell us about the concept behind Noah Technologies, Inc.
DF: Actually, Noah Technologies is simply the company name behind our product, which is Intelli-Sensor. Fantastic, tell us about Intelli-Sensor, what sets it apart from similar products, if there are in fact similar offerings on the market. 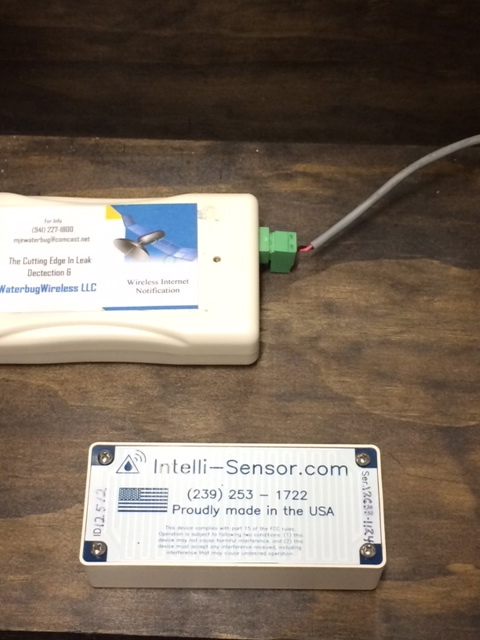 DR: Intelli-Sensor is a large area, water leak detection system that is capable of shutting down a home or business’s water supply, to prevent major damage from occurring, all while sending text and email notifications to the property owner, maintenance person, or manager that a leak has been detected, so the appropriate measures can be taken to correct the situation. DF: We position our battery-operated sensors in places where water leaks are common, such as bathrooms, laundry rooms, and kitchens. Our system utilizes a patented sensing technique that measures the volume of water present over an area of the floor; this advanced technique ensures that you have a true leak and not just damp floors, condensation or small amounts of water spills. Our customers should rest assured that no false alarms will occur; they will only receive alerts for true water leaks. After a leak is detected, then what happens? DR: When a leak is detected, a wireless signal is sent to the Receiver, located at the main water-supply valve, and two separate alarms are sounded, one at the Receiver and the other at the actual sensor that detected the leak. At the same time, text and email alerts that say “Leak Detected” are sent to your pre-chosen contacts. As the wireless signal is sent to the Receiver it also activates the automated shut-off system, which then closes the water valve, preventing major damage. The alarms that were triggered will continue to sound until the leak is fixed, and the system is manually reset, which then resumes the water flow. 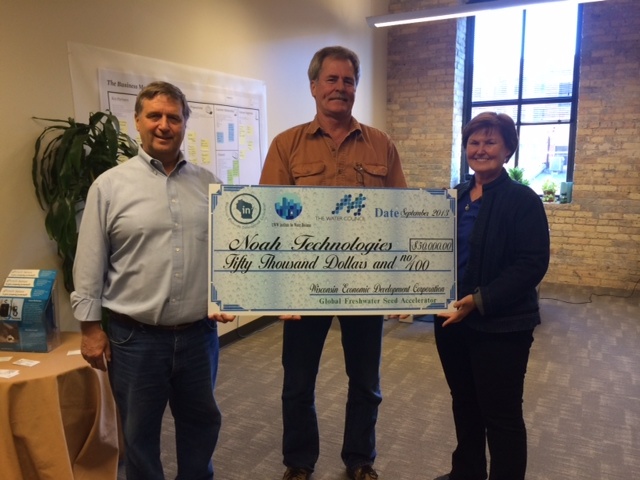 Noah Technologies is the name of the company, how did that come to be? DF: It has a lot to do with our sensors; they will beep for 40 days and 40 nights, before the battery fails, much like Noah and the Ark. CS: David and Dan met in Florida, spoke, and decided that they each had an idea on how to make a product that would work for what Dan needed and what Dave could do. DR: There are a number of leak detectors on the market that utilize the same twin metal probe detection systems. Our system generates an electromagnetic field over an area and determines the presence and amount of water based on the returning signal; it’s a much more reliable way of detecting whether a leak is there or not. DF: The other products out there are constantly flooded with false alarms, anything can trigger them because they’re too sensitive, they corrode, and then they aren’t sensitive at all once corrosion occurs. How did you get involved in the development of water sensors? I know you mentioned that Dan and David met in Florida, tell me about that a bit more. DF: I’m a state-licensed contractor in Florida. I’ve always done insurance repairs, mainly from water damage. I developed another product that detects leaks from the underside of toilets. Around that time is when I met David; I had some issues that I wanted solved, and David had a way of solving them, so we formed the business, and have installed our system in a few buildings in Naples, FL, over 125 units. They have been in place for about a year, with over 93 leaks so far, which our sensors detected, and there have not been any insurance claims made from any of those leaks. DR: The previous year, before installation, they had over $180,000 worth of insurance claims, so the insurance company just raised their rates, but now, since our sensors have been installed and no claims have been made, the insurance company has given them a reduction on their rates, it’s a win-win situation. Tell me about your experiences as entrepreneurs, any challenges or risks you’ve encountered along the way, and what has been most fulfilling so far. DF: The biggest challenge we’ve faced on the marketing and sales end of Noah Technologies is longevity in our business. We’re a startup company, and have only been together a few years developing our product. When we go into a multimillion-dollar development to sell our system, the customers want to see references, number of buildings/units we’ve done so far, unfortunately, we don’t have sufficient history because we are so new. DR: We’ve made multiple systems, but they didn’t quite work, we went through a process of fine-tuning the sensors and receivers, but in order to continue to develop the product we needed cash flow, as well as customers willing to let us use their units as test sites. DF: We’re not talking your average, small house; one of them was a 10,000 sq. ft. penthouse. The owner liked our system, and stood with and believed in us, even when it didn’t work. He kept assuring us that we would get it right and not to worry about it; that type of encouragement, and support has helped us grow Noah Technologies to what it is today. Have you set milestones you hope to accomplish, or, are there milestones that you’ve already achieved, that you’d like to share? DF: There are two milestones that we’ve achieved already, one was when we sold the Intelli-Sensor system to 105 units in a single Florida building, and were finally able to make a profit, and say “now we’ve got a major project under our belt,” which adds to our credibility. The other was being selected to participate in the Global Freshwater Seed Accelerator program and receiving the grant to continue to grow our business. DR: Another major milestone was receiving FCC Certification which was completed successfully earlier this year. DF: We’d also like to form a partnership of sorts with some of the major insurance companies. Perhaps in the form of backing Noah Technologies, or promoting Intelli-Sensor to their customers, the benefit being that they would save money by preventing disastrous leaks, and the insurance company would benefit from not having to pay out claims on those leaks. What benefits have you noticed since being located in the Global Water Center and participating in the UW-Whitewater program? DR: The benefits have been enormous, we’ve made many, many new connections, and we’ve only been here for just over a month. DR: Cross-fertilization, everybody helps each other. We come up with problems that the other startups will help us solve, and vice versa. Someone else will say they are struggling with something, and you have a dozen other people that will immediately come to your aid, and work cohesively to solve the problem. Do you have any advice for other entrepreneurs looking to enter the water industry? CS: The water industry is the place to be right now, because it’s such an important part of our lives. There are a lot of good things happening out there, and the fact that we have this opportunity to meet and talk to people in the same industry, that are familiar with the different technologies associated with the full water cycle is fantastic. DR: You need to have a good relationship with the supplier of the parts you will be using, we manufacture electronics; I made a good, personal connection with a wholesaler, Lakeview Electronics, Grafton, Wisconsin that provides all the parts, and that proved invaluable. CS: The other thing is finding a strong mentor, someone that wants to work with you, and help you out when you run into a problem, you have someone to talk to and guide you to others that may be able to help you out as well. DF: You realize that you cannot do it yourself, it does require other people, whether it be mentors, or just another set of eyes looking at a problem differently, from a unique point of view. Is there anything that you’d like to add, or thoughts you’d like to end on? DR: In addition to growing the number of systems that we install, we are also looking for different applications of our sensors, for instance using them to alert people that their sump-pump has stopped working. Or, in areas where water is scarce, or very expensive, our leak detection can act as a conduit of water conservation by shutting down the water supply, to prevent waste. CS: You have to hang in there, you’ll go through a lot of ups and downs, but you have to be persistent and eventually you’ll find the right mix. David Rice, president, has run a successful electronic design and consultation company for many years. Most recently he designed a UV-based disinfection system and a membrane system for wastewater treatment plants. Dan Fish, vice president, has run a contracting business for over 30 years, and has also designed a leak system that minimizes damage to units directly below the leak. Carol Strackbein, corporate secretary, has been the vice president and president of and is still active in the Wisconsin Wastewater Operatives Association. She has been the vice president, president and treasurer of the Central States Water Environment Association, and was employed as a sales manager in a major Wisconsin wastewater treatment plant manufacturer for many years. Mary Ratliff, treasurer, is an experienced account and office manager at a major textile office that supplies products to hotels and resorts in Florida. 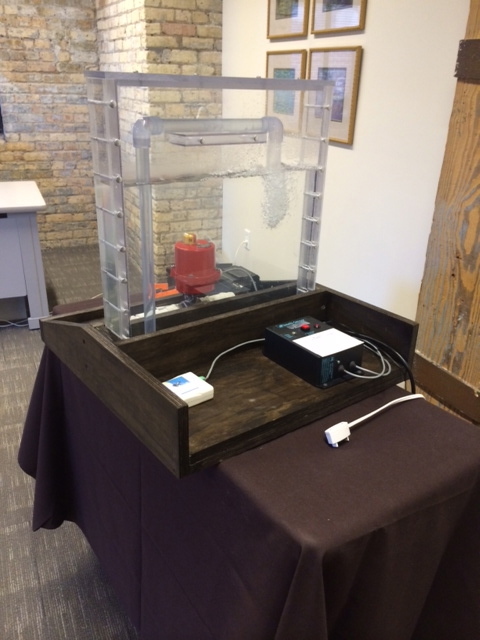 This entry was posted in Global Freshwater Seed Accelerator Program, Global Water Center, Water Accelerator Center and tagged Global Freshwater Seed Accelerator, Global Freshwater Seed Accelerator Program, Global Water Center, Intelli-Sensor, Milwaukee Water, Noah Technologies, The Water council, UW-Whitewater, water, water sensors, Water-leak Detection, Wisconsin Economic Development Corporation. Bookmark the permalink.